I listen to a lot of podcasts on my iPhone - NPR when I feel like substance, Sarah & Vinnie when I feel like trashy goodness - but the iPhone's interface for podcast listening has never been great. When I first got the thing, the problems were pretty glaring - for example, the podcasts played in reverse chronological order, which made no sense for three-hour shows broken into chunks. Things have gotten better since then, one piece at a time, and there's one feature in particular that I'd like to point out about the latest update. "Scrubbing" a podcast - that is, moving the position slider to get to a different time in the recording - was previously a difficult task. An hour-long podcast displayed as a 1-and-a-half-inch slider to be manipulated with a large index finger meant an accuracy of plus or minus 3-5 minutes - not good enough! 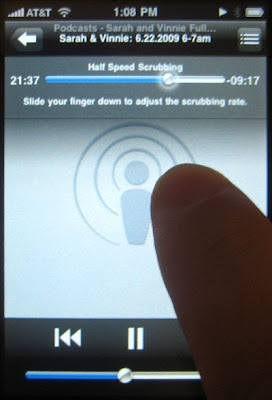 With the latest update, though, the iPhone offers variable-speed scrubbing; as seen in the image, drop your finger down in the area below the position slider, and it will have a finer effect on the scrub. The area is broken into regular-speed, half-speed, and quarter-speed, and "fine" scrubbing, which is learned quickly enough with a little hands-on (or fingers-on) fiddling. Even better, the audio automatically plays at the new location before you remove your finger, so you can get feedback on the new location before finishing the scrubbing operation. It may seem like a small improvement, but it's a big deal for those of us who (now) use it a lot. And it's not just me, I promise - Eddie Lopez at User Centered has been meticulously chonicling the features and omissions of the iPhone and other products. Keep on making it better, Apple -and we users will keep pushing you!